Usain Bolt‘s form coming into this year’s World Championships in Beijing was a mystery, as he had run only a handful of races and barely managed to win them. This was not the sprint legend the world was used to, and most people were worried, especially as his American rival Justin Gatlin was running world leading times left, right and centre. As they lined up in the 100m finals, the only person who thought he had a chance was Bolt himself, and the champion once again proved his mettle, snatching the gold in 9.79 seconds. 2005 – Helsinki, Finland: This is probably one of the moments Bolt would like to forget, as he pulled a muscle in the 100m final and finished last. 2007 – Osaka, Japan: It was time for redemption, and the former teen sensation indeed gave a good account of himself. He finished behind Tyson Gay in the 200m to claim his first senior World Championship medal in 19.91 seconds, and returned to help the 4x100m relay team (with Marvin Anderson, Nesta Carter and Asafa Powell) secure a silver medal in 37.89, a new national record. 2009 – Berlin, Germany: Having dismantled not one, but three world records at the Beijing Olympics the year before, all eyes were on Bolt to see if he could repeat his seeming otherworldly feats. And repeat, he did. Two of his still-fresh world records were cleanly erased. The 100m record of 9.69 seconds was replaced by the even more unbelievable 9.58 and 19.30 seconds in the 200m was replaced by an unfathomable 19.19. The relay team (with Steve Mullings, Michael Frater and Powell) was once again unstoppable, stopping the clock at a championship record of 37.31 seconds. 2011 – Daegu, South Korea: Bolt once again stunned the world in the 100m final, but it wasn’t with a new world record. Perhaps affected by the outstanding form of compatriot Yohan Blake, he false started, leaving the crowd in an uproar. He was desperate for redemption in the 200m and took home the gold in a world leading time of 19.40 seconds. The 4x100m relay team (with Carter, Frater and Blake) was again in a world record breaking mood, taking the mark down to 37.04 seconds. 2013 – Moscow, Russia: It has been another successful Olympics in London in 2012, as he defended his 2008 titles in fine form and claimed another world record of 36.84s the 4x100m relay team (with Carter, Frater and Blake). 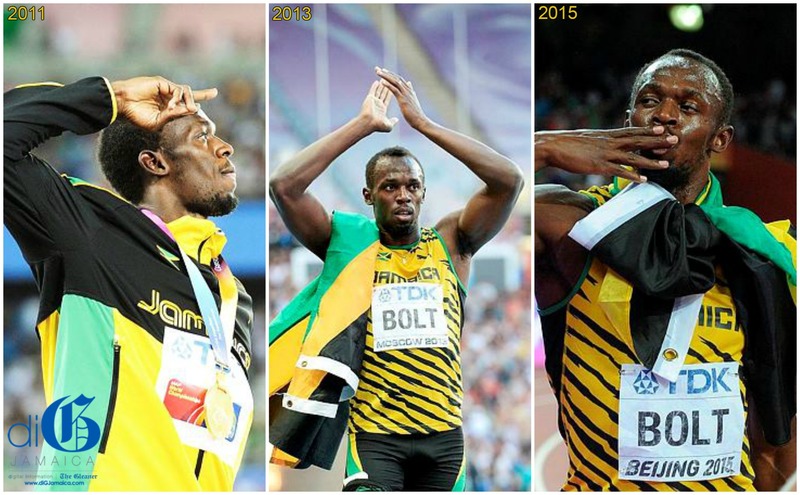 Bolt was eager to reclaim the 100m title he had lost in Daegu and did so in a world leading time of 9.77 seconds. He defended his 200m crown in a world leading 19.66 seconds and the 4x100m relay team (with Carter, Kemar Bailey-Cole and Nickel Ashmeade) again secured the gold in a world leading 37.36 seconds.